Nnoseng Ellen Kate Khuzwayo was born on the 29th of June 1914 in Lesotho. She grew up on her grandfather's farm in Thaba Nchu and inherited the farm in 1930 but lost it soon afterwards when it was declared a "white area". Although her parents were divorced when she was very young, Ellen grew up surrounded by cousins and aunts. She began school at the age of seven proceeded to St. Paul's Higher Primary and to St. Francis' College, where she was a boarder. Ellen’s mother died when Ellen was 16 years old, after this she threw herself into her studies. After attending Adams College for four years, she spent an additional year at Lovedale College in Fort Hare, graduating in 1936 at 22 years of age. On graduaing from Lovedale, Ellen had reached the highest degree that could be attained at any teacher training college for a black person at that time and so she began a career in teaching. In her late twenties Ellen married Ernest Moloto but the marriage was not a happy one. She gave birth to two boys, but Ellen fled to Johannesburg because of abuse from her husband, leaving her young sons behind. After her divorce, Ellen threw herself into many activities on top of her teaching duties and even did volunteer work with local youth groups. Ellen returned to school at the age of 39 and completed the training program at Jan Hofmeyr School of Social Work. Armed with a degree in social work, and a higher diploma in social work from the University of Witwatersrand she began working with the Johannesburg City Council. After this she worked with the South African Association of Youth Clubs and for the YWCA-Dube Center. Her career peaked when she accepted a position as General Secretary of the YWCA-Transvaal Region in 1964. While holding this very challenging post, Ellen maintained her connections with her community, encouraging women to work together in self- help groups. After the Soweto uprising of June 1976 and the arrest and killing of large numbers of young people, Soweto residents chose ten persons to study the role of members of the local councils who were cooperating with the apartheid regime. Ellen and nine men were selected to the Committee of Ten but all ten members of the Committee were picked up by the police and detained without trial. Ellen was held in the Johannesburg Fort for five months. Ellen’s activities included being president of the Black Consumers’ Union and serving on the executive committee of the Urban Foundation. She has published Call me Woman (1985) and Sit and Listen: Stories from South Africa (1996). In 1979 the Star named Ellen Woman of the Year. The Universities of Natal, Port Elizabeth and Witwatersrand awarded her honorary doctorates in recognition of her remarkable work. 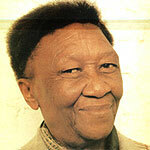 In 1994 Kuzwayo was appointed an African National Congress (ANC) member of paliament. She died on 19 April 2006 age 91. Khuzwayo is survived by her sons Bobo and Justice Moloto, six grandchildren and three great-grandchildren.